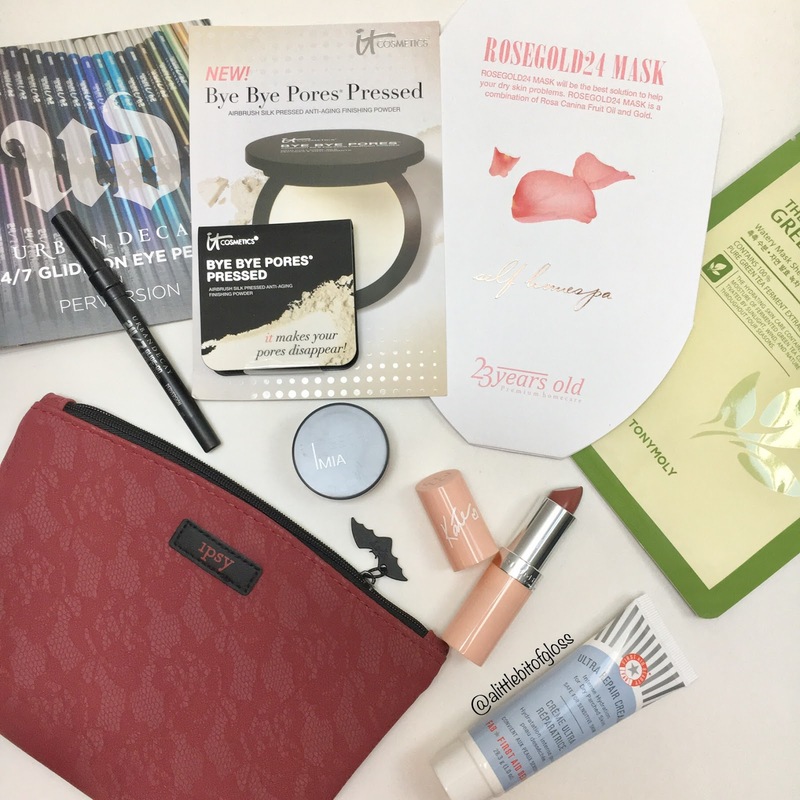 I was really surprised with all the unnecessary paper included with some of these products but I was very happy to get the new UD eye pencil and sheet masks :) I rate the October Ipsy Glam Bag a 5/5. Urban Decay 24/7 glide on eye pencil in Perversion- Social media can be a wonderful thing. I've found many Ipsy spoilers from my fave subscription accounts and I always get giddy when you find out that you're able to request specific items for your next Glam Bag. Last month I requested the UD eye pencil and I'm so so happy I did. The formula is so smooth yet long lasting. I prefer pencil liner over liquid and I'm happy to report that this will definitely be added to my regular routine. First Aid Beauty ultra repair cream- I've been a huge fan of FAB for a while now so it's no surprise that I loved getting this sample in my bag. This cream absorbs quickly and leaves your skin feeling nourished and supple. This formula works well on all skin types and every member of your family (even kids) could use this cream. It's perfect for keeping in your bag or purse for when you need a quick fix. I like that this cream is also versatile and you could use it from head to toe. My skin gets really irritated during the cooler months so I appreciate having more of what I already love. It really is the perfect cream for everyone! Rimmel London lasting finish lipstick by Kate in Shade 47- I'm not the biggest Rimmel fan, but I must say, this formula is like a hydrating lip balm. I wore this lipstick for a party and I did have to reapply throughout the night even though the claim is "a creamy formula that stays on for 8 hours". OK so maybe that would work if you don't talk, eat, or drink for 8 hours bahahahha! Meech and Mia loose eyeshadow- I'm excited to play around with this loose eyeshadow since I don't have much experience with products like this. The colour is highly pigmented and blends nicely. I got the purple shade that has a bit of shimmer. I like! 23 Years Old Rosegold24 Mask- This was the first mask I tried that didn't have a mouth opening and I was surprised when I first opened the package. I look so creepy right??! I got this mask for free using my Ipsy points and thank goodness for that because my first impressions of this mask aren't all that great. There was a ton of essence and the mask fit ok. My skin was left a bit sticky after wearing the mask for 20 minutes and I didn't notice any immediate benefits. The fragrance was ok, but a bit too clinical for my taste. 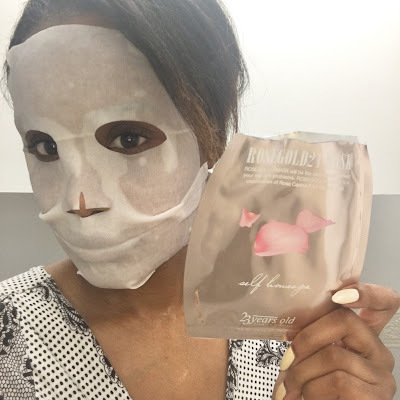 Don't fall for the pretty packaging- this mask didn't perform as promised! This mask was just ok.
Tony Moly Green Tea Watery sheet mask- I haven't used many Tony Moly masks so I was happy to score this one for free using my Ipsy points. I love anything with green tea in it so this was a real treat! I liked the fit of the mask and the essence absorbed well. I'll definitely repurchase! Did you get your October Glam Bag and if so, how did you like it? I'd love to hear from you!